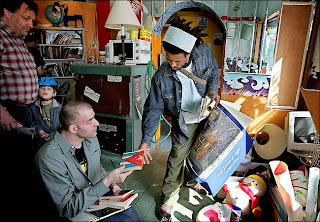 I first became acquainted with the Brooklyn Free Store at it's Wlliamsburg location in 2002, but it wasn't until January 2005 when as a part of In Our Hearts I became one of the individuals responsible for opening and closing and generally maintaining the space on a daily basis. I helped organize events and fundraisers and along with an entire community of other volunteers helped to keep the space clean and stocked with usable items. I eventually moved into the adjoining apartment. 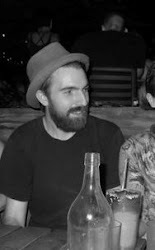 As the neighborhood rapidly gentrified, economics made staying impossible and by the end of the year the space was shuttered. 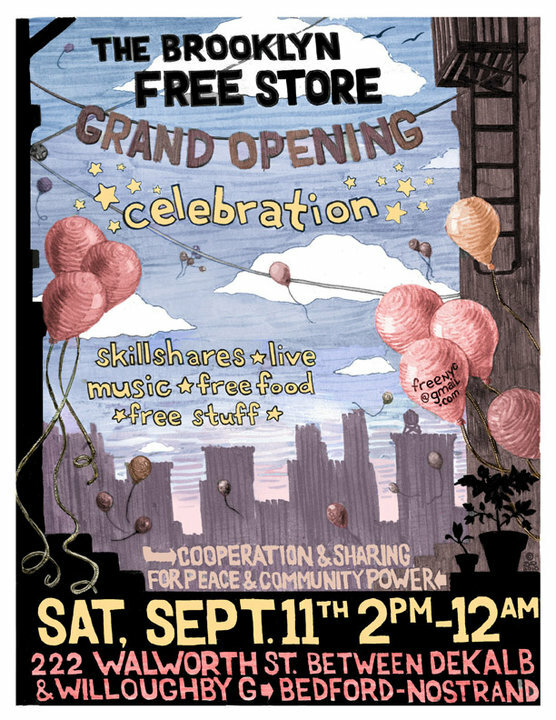 In June 2010 I helped to found the new Brooklyn Free Store in a once empty trash filled and weed covered lot at 222 Walworth St. The effort was initiated by both neighbors and former volunteers of the 123 Community Space which had been locating only five short blocks away. After clearing the lot of debris and weeds a fence was built and cemented into the ground to secure the space, should we decide to lock it up. At first the store consisted of a simple 10'x30' canopy tent that we soon realized was far from water proof and mismatch of found shelving inside. We also quickly learned that it was best to affix the shelves to the plywood floor or the nearby fence so that it was clear they needed to stay. People in the city seem to be just as eager to not throw away and pass on useful items as they are to get something for free so the store was perpetually full for the first few months. Keeping the tent standing was however a problem that we grappled with continually, especially during particularly windy and inclement weather. Thanks to an overwhelmingly positive and active number of volunteers, (the vast majority of which were neighbors who self organized) the store always found it's feet again and was cleaned up better and almost as good as new. Of course a bent pole can only be bent back into shape so many times before it snaps. 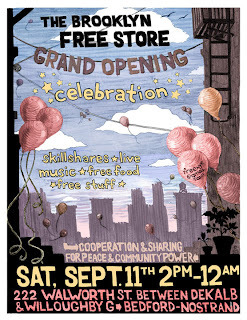 The first major event held in the space was a grand opening celebration on September 11th. It was a wonderful all-day-event similar to a Really Really Free Market. There were classes on self-defense, home-brewing, bicycle maintenance, kombucha, face painting, portrait drawing, a legal know your rights training, an In Our Hearts info table, poetry and live music. By December plans had been drawn up and were underway to construct a more permanent wooden structure to house the store. The plans didn't require us to purchase a single thing. 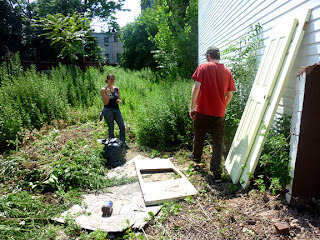 Tools were borrowed, screws were donated, wooden "one-time-use" shipping pallets along with some discarded two by eights were scavenged. The water proof outer shell was to consist of used billboards. After a few weeks of work that included shoveling off the product of a blizzard that paralyzed the city for days our structure was complete. Around this time an unknown supporter dropped of an entire store's worth of wooden shelves, which we happily put to use. 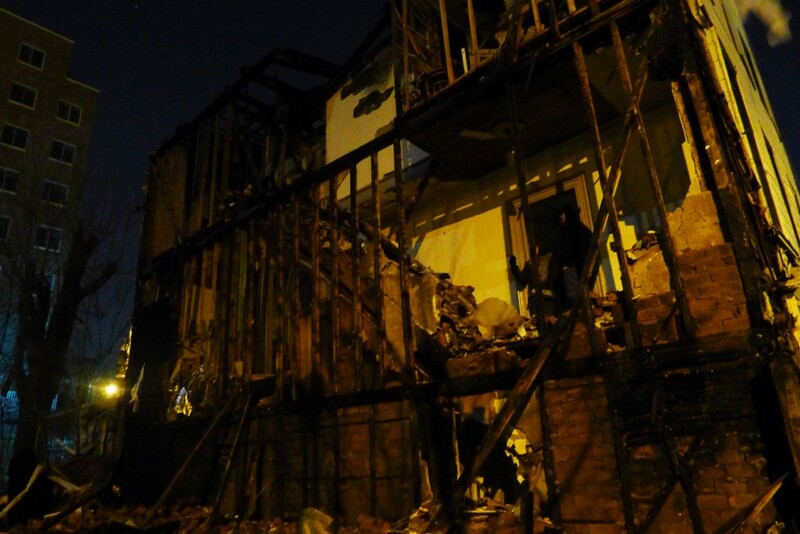 Sadly soon after that the store became the target of at least one determined arsonist. The first two fires were extinguished by neighbors and passersbys but the third burned out of control, destroying the entire structure and the adjacent home where I and a number of others lived. 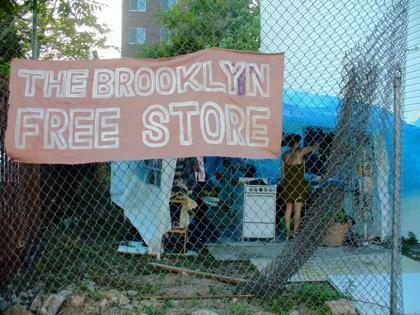 Despite this tragedy the Brooklyn Free Store Continues! 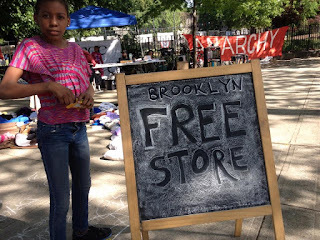 Since the summer of 2013 the Free Store has been open every Friday (weather permitting) and occasionally on Sundays, on the corner of Lafayette and Marcy Avenues in BedStuy Brooklyn at Von King Park, just one block from the Nostrand exit of the Bedford-Nostrand G train stop. 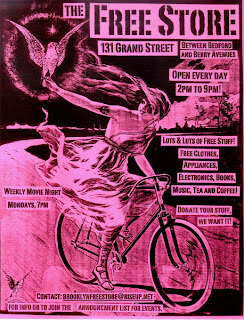 Vulture Culture - short film by Eric Rockey documents the evolution of the Brooklyn Free Store located at 222 Walworth St.
All are welcome to come and share what they have or just take what they’d like. We always have hundreds of books, household goods, food, as well as bags and bags of used and new clothing. There is no obligation to share or anything. Everything is shared in the spirit of community and mutual aid, please participate with that in mind and respect others. 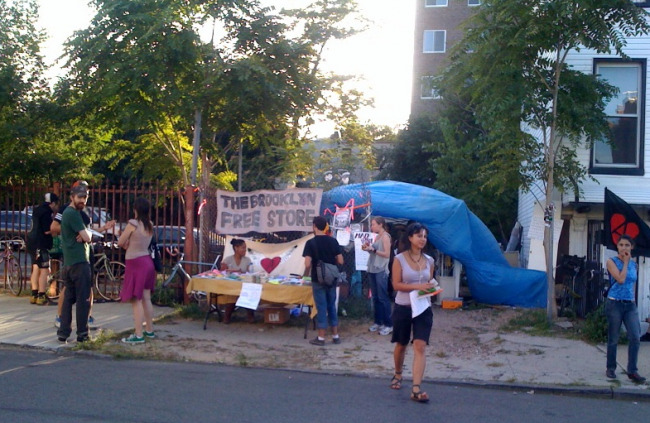 Since 2013 Brooklyn Free Store volunteers have taken the our model spreading mutual aid to other communities from Oakland, CA to Long Island, NY. There was also an affiliated free store at Purchase College in Westchester, NY. 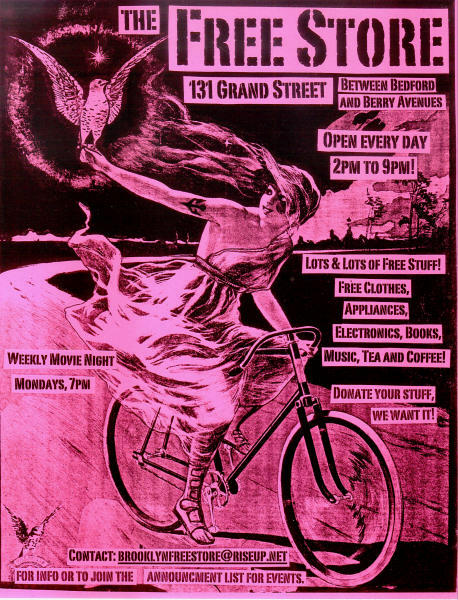 As of 2015 we are looking to expand the Brooklyn Free Store to more neighborhoods and hours within NYC and welcome new volunteers interested in supporting that!